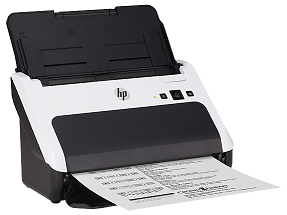 HP-SJ-3000-S2-Scanner Turn the page on your paper-intensive processes. Save time with smart, reliable scanning that's easy to integrate and adds efficiency to any office. Count on clear, legible results from a compact scanner designed to help save energy. Save time —and skip steps with HP Easy Scan. Create quick shortcuts to help add efficiency to your business. Save time — with automatic two-sided scanning. Reliably handle a variety of paper types, thicknesses, and sizes. Avoid missing pages—in scanned files—HP EveryPage Ultrasonic feeds one page at a time and auto-aligns. Start fast and move on.— Instant-on Technology lets you begin scanning quickly from low-power mode.